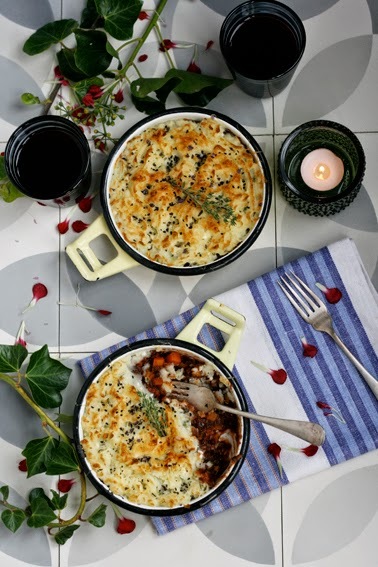 This Lentil Pie with Feta & Thyme Mash is my go-to comfort food at this time of the year. Growing up, Shepherd’s Pie was one of my mum’s specialities that made regular appearances on the kitchen table much to my delight. This is my vegetarian, slightly tweaked version. The hearty lentil base made from onion, garlic, carrots and a rich tomato and herb sauce is topped with a creamy thyme mash with a surprise salty-feta hit. It’s a great combination. As well as tasting good it’s a practical recipe too: it can easily be portioned up and frozen, ready for an effortless TV supper for one. Likewise, serve it with a side dish of sautéed kale or a spinach salad and it can pass as an elegant dinner party main course (I know, I’ve done so successfully on many occasions). Also, its always goes down well with the kids, which is never a bad thing. Feel free to substitute some of the ingredients for what you have to hand. I very rarely make this recipe exactly the same twice. If I have rosemary on the balcony I use that instead of thyme. If I have some goats cheese in the fridge then that can happily replace the feta. Likewise with the vegetables, feel free to throw in a few zucchini in place of the carrots if that is what you have. 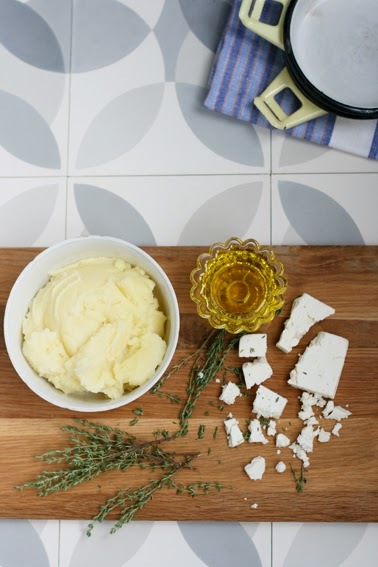 You may have noticed the beautiful tiles that I had the joy of shooting with in this post. They are from Lindsey Lang - thanks so much for the loan Lindsey. Lindsey is one hell of a talented lady who in addition to her flooring collection also has a gorgeous range of kitchen textiles and has just designed some beautiful towels for John Lewis. Do seek her designs out. Also, I must extend out my thanks to Simone at Keep It Vintage who often allows me to borrow some of her lovely products for my shoots. This girl has a real eye for picking out some must-have vintage and retro pieces. The enamelware, textiles and the bowl in the last image (below) came from her treasure trove of a shop. Lentil Pie with Thyme & Feta Mash. Heat a little oil in a large pan and sweat the carrots and onions on a low-med heat until slightly softened (5 – 10 mins), then add the garlic and continue to cook for a minute or two longer. Next add the lentils, followed by the tinned tomatoes, vinegar, wine and the fresh and dried herbs. Stir and then slowly add the gravy, adding a little hot water if the overall consistency is too thick. Turn the heat down a little and cover the pan loosely with a lid and let it gently bubble away, filling your kitchen with the most delicious aroma. You want the carrots to be tender and the flavour of the sauce to come through. 15 – 20 minutes should do it, but keep your eye on it, adding a little water if the mixture starts to dry and taste as you go to check its progress. Season with black pepper and a little salt should you wish. When the base is done, turn off the heat and keep to one side. While the lentil base is cooking, you can start your mash. 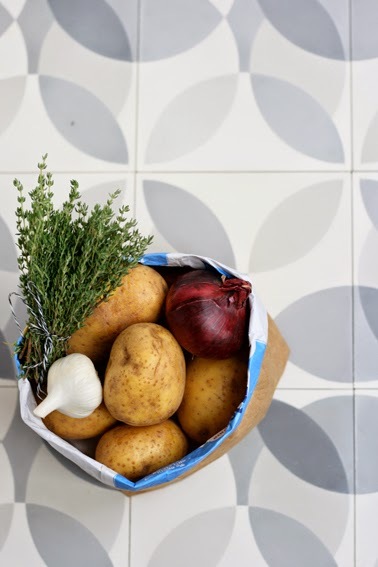 Peel and chop your potatoes into equal-sized pieces and add to a pan of water. Cover the pan with a lid and bring to the boil, then turn the heat down to medium and simmer for approx 10 mins or until the point of a knife effortlessly slips through the potatoes. Drain and set to one side. Taking a small bunch of thyme or several sprigs, strip off the leaves and add to the potatoes. Next drizzle in your oil, a little at a time, and start to mash your potatoes (I use a hand whisk for this). You may not need all the oil or you made need a dash more. Once your mash is smooth, crumble in the feta and gently fold through and season with some black pepper. Preheat your grill to high. Decant your lentil mixture into an oven dish (or individual dishes) and top with the mash. A light grating of parmesan cheese, a dusting of dried basil and a sprinkle of Nigella seeds is a nice finishing touch, but by no means essential. Pop the pie under the grill until the top is golden. Serve as it is, or with some vegetables of your choice. Enjoy. Note: if you want to make this ahead of time, you can do so. Just cover the cooled pie with foil and place in the fridge. When ready to eat, remove the foil and pop it into an oven pre heated to 200°C and bake for 25 -30 mins or until golden and heated through.